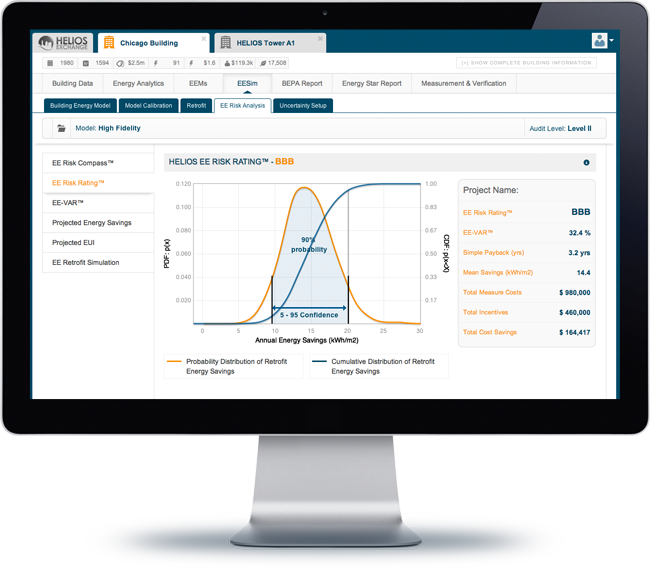 Capturing and rating energy savings with confidence is critical for obtaining financing. Although returns on investment are usually very attractive (avg, ROI > 25%), building energy retrofits require significant upfront capital (~ $3/ sq.ft.). Gaining confidence in the value of energy savings is critical to convince CFOs and Investors that cash flows from savings will be delivered, and thus offer performance guarantees through energy savings insurance. HELIOS EE-RISK™ provides a rigorous evaluation of the probability of achieving a certain level of savings from a retrofit project, which can then be insured.